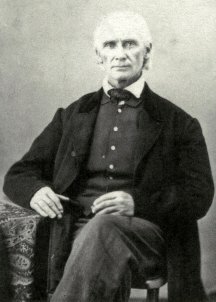 George Bever was born 25 March 1800 in Rockingham County, Virginia. He had at least one brother, Solomon. On 7 April 1825 he married Sabina Bretz. Sabina Bretz was born 4 April 1802, and her father was Philipp Bretz. I have not done research on Sabina, but I do have a postcard photo that indicates that the Bretz family was planning to hold a Family Reunion on 26 August 1914. 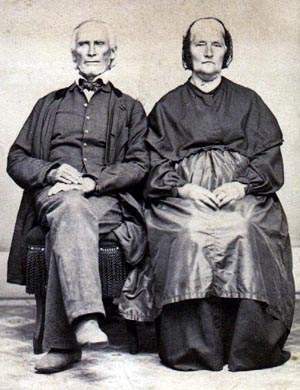 George and Sabina had eleven children: Alice Ann, Solomon, Susannah, Melissa Ann, Samuel, Joseph, Henry, Gideon George, Sabina Adaline, Sarah Ann, and Amanda. 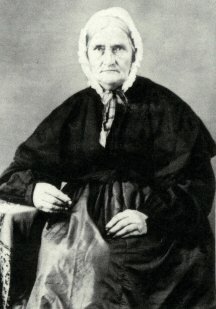 Their sixth child, Joseph, was my great-great grandfather. "Negatives preserved, additional copies may be had any time." A Second Cousin Twice Removed gave me the following photocopies. Both of these photos were taken by "Pennington & Fay", though the imprints are different. Sabina's photo has a serrated outline where a stamp was at one time.